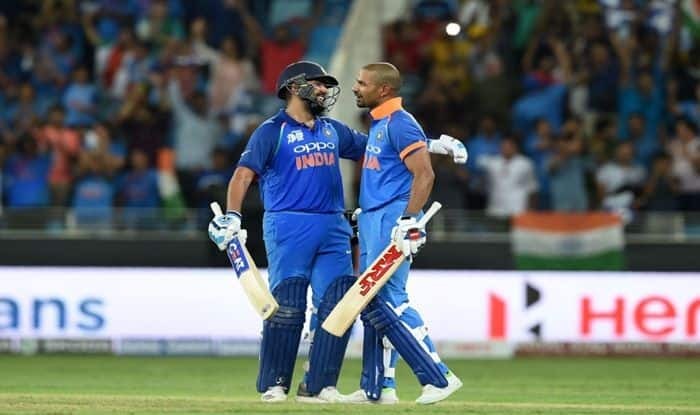 During the 2nd ODI against Australia at the Adelaide Oval, Rohit and Shikhar became only the second Indian opening pair after the legendary opening duo of - Sachin Tendulkar and Sourav Ganguly to go past 4000 runs in 50-over format. During the second ODI against Australia at the Adelaide Oval, Rohit and Shikhar became only the second Indian opening pair after the legendary opening pair of – Sachin Tendulkar and Sourav Ganguly to go past 4000 runs in ODIs. Tendulkar and Ganguly, who opened together from 1996 to 2007 in 136 innings, added 6609 runs and were involved in 21 hundred-run and 23 50-run partnerships. The Indian duo becomes fourth overall in the world to score 4000 runs as a partnership. The two started opening the innings back in 2013 during the ICC Champions Trophy in England which India won. Over the last several years, Rohit and Dhawan have been among the most destructive opening batsmen in world cricket and have been instrumental in several Indian victories. Tendulkar and Ganguly continue to be the most successful opening pair in ODI history followed by Australia’s Adam Gilchrist and Matthew Hayden (5372 runs in 114 innings) and Windies’ Gordon Greenidge and Desmond Haynes (5150 runs in 102 innings). After scoring five hundreds in 2013, the explosive southpaw (Dhawan) went on to score 10 more ODI hundreds up until 2018. Till date, he has 15 hundreds and and 25 fifties against his name. On the other hand, Rohit has enjoyed even a more meteoric rise in 50-over format. Before the 2013 Champions Trophy, he had 2 ODI hundreds. Today, he has 22 hundreds in the format and is the only man to score three ODI double hundreds. In the last two years, the dynamic right-hander scored 1293 runs and 6 hundreds. Next year, he smashed 1030 runs and 5 hundreds before beginning 2019 with a stylish hundred in the first ODI against Australia at the Adelaide Oval.